Well we had one day with sunshine and no rain, that was nice. Looks like maybe more coming but good to have a break because the ground is so saturated. My image from today is from Friday evening after it rained most of it. 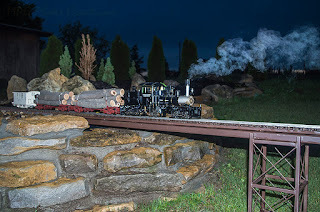 We were at our friend's annual Steam Up and when the rain finally stopped I went out to run on his new layout that had just been finished that day. 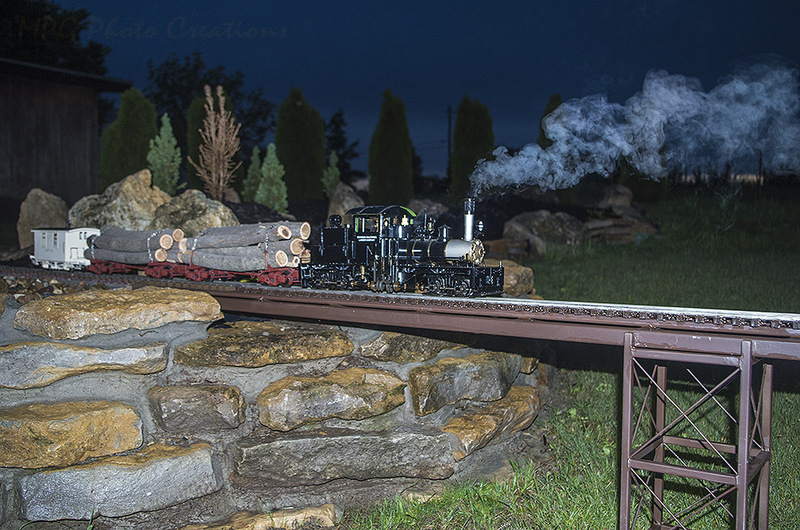 I had the first successful run on it which you see a shot of here, with my Shay locomotive. It was getting dark so I had to take shots with a flash but I like how it made the steam stand out against the dark sky. It was really putting out the steam because of the humidity in the air. It runs on butane and water.